This is a tutorial I wrote up and posted up on my blog. I recently got Windows 7 and Ubuntu running in a dualboot. However, since I’m using more of Windows now I figured I should probably find a way to run Ubuntu inside my Windows. VM’s are great, but it’d be better if I can actually boot into my existing Ubuntu partition. So I searched the web and kept on finding tutorials on how to boot existing XP partitions inside Windows. So I decided to extrapolate from those tutorials and work my way through it. I’ll be writing how I did it here. Before we begin, you should have a dual boot setup. I will NOT be showing you how to setup a dual boot, if you need help plenty of other guides out there. The grub iso file will allow you to specify which partition to boot into. 3. Configure your ~/iso/boot/grub menu.lst file to boot your target OS (in this case Ubuntu). Remove the “savedefault” option from your target entry if it exists. This creates a file which tells Virtualbox what partition to actually load as the harddrive. Unfortunately, unlike VMWare Workstation, Virtualbox does not support a GUI interface for selecting RAW hard disks as the “virtual hard drive”. Now everything should be ready to setup Virtualbox. Create a new virtual machine. Select the .vmdk file we just created as the hard drive and mount the grub.iso file we created at Step 1. If everything was successful Ubuntu should boot up nicely. Wonderful! I created an account on this site just to thank you! I just have one small problem: Not able to run the guest at more than 800x600 resolution. I'll try my best to find out a way. If there isn't one, I'll just ignore it. Nevermind, I just needed to install the VirtualBox guest add-ons and it worked! Hi, first of all great and useful tutorial. You (or anyone) got any idea how this works in a recent version of ubuntu? can you use this the other way round, i would like to use more ubuntu and less windows, but i want dual boot if needed. would be nice to use the current windows7 i have installed as virtualbox, under ubuntu. BTW if possible if i boot into windows (normal boot) would this do bad things? Brilliant!!! I spent enormous time solving this booting problem. This post helped finally! Many other posts on this issue point to the fake mbr way which I tried but got no luck. I guess the problem is all about helping virtualbox find the right boot record. The boot iso method is not the perfect way to do that since it depends on boot iso image but it's absolutely an ingenious method! Thank you very much! In ubuntu 11.10 I use grub-mkrescue which can make rescue iso image for your system. Make your own iso directory (e.g. /root/iso/boot/grub/) and copy /usr/lib/grub/i386-pc into it. After all those steps, you'll get your iso image. And then follow the other steps metioned by Jexel. Good luck! Hi, I didn?t check back for some time, but now I found your reply. I did create the ISO the way you described, and managed to create the ISO. After initial problems when I did not start Virtualbox as admin I got to the grub-screen. Does this mean it does'nt need to boot windows anymore? 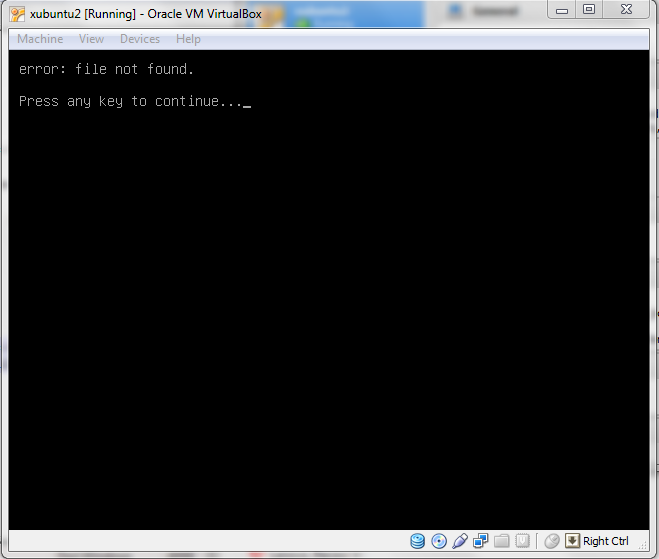 Unfortunately, it didn't work for me: starting the VM gives it a black screen and then nothing happens. Trying to run dualbooted Xubuntu 12.4.1 from within Windows 7 64bit. however, it would only let me mount the first one. I had not correctly mounted the .iso file. When that's selected in the VM, it successfully boots from the iso and goes through the GRUB selection screen. However, then it says "file not found." (attached).